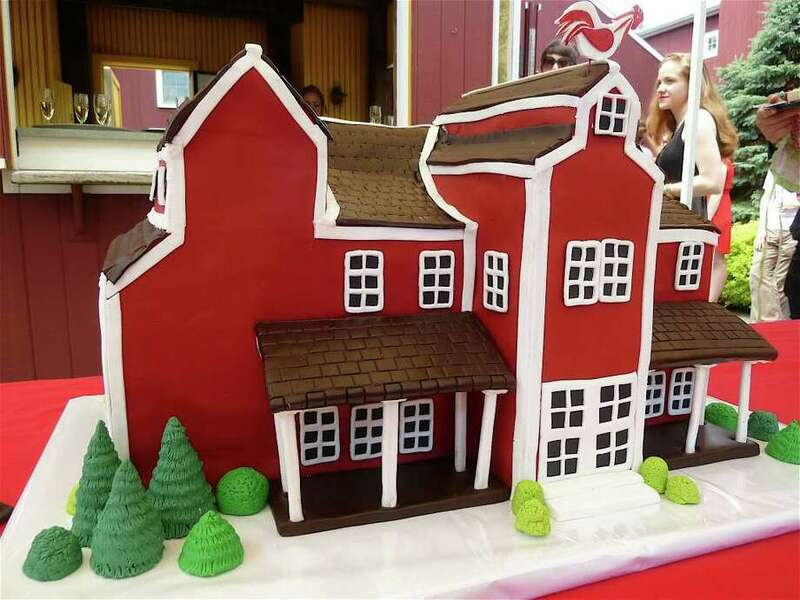 The Westport Country Playhouse -- rendered here in cake form -- was feted on its 80th anniversary Wednesday by officials and the theater community. It was a birthday when the star of the celebration was, well, not a star -- even though the celebrant's eight decades have been all about stellar productions. The birthday girl has come a long way, from a country tannery to a humble summer playhouse and now, at 80, one of the theater world's most respected grand dames of pre-Broadway entertainment. The Westport Country Playhouse was itself the center of attention Wednesday as local dignitaries and staff toasted its milestone with cake and champagne. The theater was founded in 1931 by Lawrence Langner, a producer for the Theater Guild in New York, which in the 1920s and '30s was a major force in theatrical productions there. Langner lived in Weston with his wife Armina, an actress and co-founder of the theater. "His goal was to find a place in the country where he could try out shows away from the hubbub of the city," explained Patricia Blaufuss, publicity manager for the playhouse. "The site was approximately four acres and featured a tannery which provided leather for a hat maker in Danbury. The original structure -- a barn -- was converted into a theater and existed that way until 2005, when a major renovation took place. The only remnants are the walls on either side of the theater and at the back. There's also a little patch of the old stage. For decades, actors have walked on this -- if only it could talk." "The Streets of New York," starring Dorothy Gish and Rollo Peters, was the first play performed at the theater in 1931. Langner ran the theater until 1959, when it was taken over by James B. McKenzie, who then led the theater as executive producer for the next 41 years. In 2000, actress Joanne Woodward took over as artistic director. She was instrumental in the 2005 renovations. "It really was falling apart," said Blaufuss. "The building required $18 million in work." As to the talent the theater has hosted over the years, it has included the likes of Liza Minelli, Jane Fonda and Gloria Swanson. "Besides these well-known names, there have been so many other talented artists," said Blaufuss. Attending the event on behalf of Gov. Dannel P. Malloy, state Rep. Jonathan Steinberg, D-Westport, commented, "When I was growing up, I remember people speaking with such reverence about the playhouse. Look how far we've come in 80 years. It epitomizes Westport's dedication to culture." Westport First Selectman Gordon Joseloff was also on hand for the birthday bash. "The playhouse has always been a focal point for the arts community in Westport," he said. "We're very proud of this institution. It puts us on the world stage and has an incredible track record in sending productions to Broadway. `Oklahoma' had its start here. It's part of the allure of Westport." Perhaps no happier to witness the theater's 80th birthday was Fairfielder Warren Pistey, who was born two years before the theater was founded and served as a production assistant at the playhouse from 1949 to 1951. "What a wonderful place," he said. "Everyone who came here was very talented. I remember meeting Van Johnson, Walter Abel, Claudette Colbert, Mary Rogers, Oscar Hammerstein and Jeanette MacDonald." At a midpoint in the celebration, Joseloff and Steinberg joined Michael Ross, the playhouse managing director, and Mark Lamos, the artistic director, behind a table, on top of which sat an elaborate birthday cake resembling the playhouse, fashioned by CakeSuite of Fairfield. Each made a few brief remarks and Steinberg and Joseloff read proclamations declaring June 29 as Westport Country Playhouse Day, both in the town of Westport and statewide. Lamos recognized Woodward, her late husband, Paul Newman, and others for helping "a brand-new theater rise and confront the future," and thanked Ross and the playhouse's staff for their service. He added, "The playhouse gives back to the community what the community can give to it. Thank you, Westport." Joseloff said the theater is an anchor of a great community. "Who would want to live anywhere else?" he remarked. Steinberg said the theater is "a very special place with a long association with the arts." With regard to the proclamations, Ross joked, "Yay, everyone gets free parking" and "no sales tax today." Then, as champagne and cake began to circulate, Ross, with a mischievous twinkle in his eye, added, "Champagne's appropriate at 11:15 in the morning, right?"